Starting up the album with some truly great, groovy, and nearly psychedelic tunes such as "Love and Pain" and "Hammer Ring". The first track was born out of inspiration, collaboration, and tragedy. It speak of the tragic shooting at the Route 91 Harvest music festival in Las Vegas. It reek of Jimi H and the reverse guitar thing merely add to the overall vibe of 1968, proper freedom fighters, and trippy hippies. The latter (Hammer King) having this really cool rhythm pattern and style that acts such as King's X explored and played around with in the past. Doyle sounding a lot like their singer on this track. It's a great start. I fully expected the entire album to be more of the same. 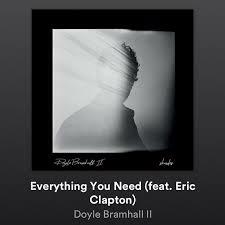 Eric Clapton appears on the R&B-tinged "Everything You Need" and it could just as easily have been released in the year of 1976. It's got that smooth sound going on at eleven and it's darn close to Yacht music or if you prefer soft-rock. This would fit nicely in with the Doobie Brothers and Clapton at the time. The duet with Norah Jones on "Searching For Love", the follow-up to the successful pairing on DBII's previous album. "Live Forever", back to the groovy late 60s, and to be perfectly honest, it reeks of CREAM. It's CREAM. Basically CREAM! So far, so good.